If you've ever lived with a Labrador retriever, you know they have lessons to teach. 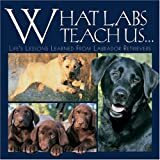 Labs are America's number one pet for a reason: they have an admirable, innate understanding of the joys and simplicities of life that makes everyone around them happier. By emulating the lessons served up every day by these generous animals, we can all learn to smile more, relax better, love with less inhibition, and appreciate with more conviction and understanding the gift of being alive. Delightful full-color images are paired with over 100 insightful Lab lessons.